Symmetric / Primary IUGR: primary or symmetric IUGR occurs when all parts of the baby including the internal organs are proportionally small in size. Around 25% of all IUGR cases are classified as symmetric. Asymmetric / Secondary IUGR: with secondary or asymmetric IUGR the baby's head and brain are normal sized but the abdominal area and rest of the body are abnormally small. Placental Insufficiency: placental insufficiency (also called placental dysfunction) is a serious pregnancy complication where the placenta develops abnormally or becomes damaged. This abnormal development is usually the result of the placenta not getting adequate blood flow from the mother when pregnancy begins. Many IUGR can be seen in cases there is placental malperfusion that prevents sufficient nutrients from being delivered from the mother to the baby. Substance Use: smoking cigarettes, using alcohol, or drug use during pregnancy can disrupt nutrient and oxygen supply and trigger IUGR. Maternal Infection: a number of maternal infections have been shown to affect the delivery of nutrients to the baby during pregnancy. Maternal Hypertension: maternal high blood pressure or other cardiovascular disorders can restrict blood circulation to the placenta and restrict nutrient supply to the baby. Birth Defects: genetic birth defects and chromosomal abnormalities can also interfere with nutrient and oxygen delivery to the baby during pregnancy. There are a number of known risk factors for IUGR, many of which tend to overlap with the underlying causes listed above. One of the strongest risk factors for IUGR is multiple pregnancy (i.e., twins, triplets, etc.). A pregnancy with twins or triplets is much more likely to involve IUGR than a singleton pregnancy. Women who are chronically underweight or with a history of eating disorders are also at increased risk of IUGR. 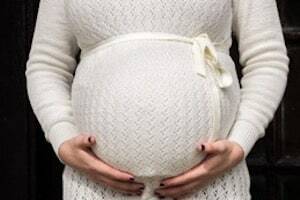 Finally, certain maternal medical conditions including diabetes, anemia and cardiovascular disorders can make IUGR during pregnancy more likely. The first critical step in diagnosing IUGR is dating the start of the pregnancy with a high degree of accuracy. The timely diagnosis of IUGR is essential to ensuring a positive outcome. Many studies have shown that fetal mortality and morbidity increase when IUGR is not properly or timely diagnosed. When properly diagnosed, the standard of care requires intense antenatal surveillance with regular non-stress tests and biophysical profiles. Dating the pregnancy (i.e., the day shortly after conception when the embryo attached to the uterus) is crucial because a diagnosis of IUGR is wholly dependent on the gestational age of the baby and gestational age is based on dating the pregnancy. During the first 2 months of pregnancy, gestational age is based on the date of the mother's last period. Sometime after week 9-10 the first ultrasound test is done and doctors use this to further refine the date of the pregnancy. Dating the pregnancy allows doctors to calculate the baby's gestational age. Once the gestational age is fixed the growth of the baby can be tracked and analyzed based on charts of normal growth rates. Calculating the size and weight of fetus can be difficult. Doctor estimate size based on uterine fundal height measurements and ultrasound imaging. Once IUGR is diagnosed, the appropriate course of treatment or management will usually depend largely on how far along the pregnancy is and the apparent health of the baby. If the pregnancy is in week 34 or more, most doctors will suggest early delivery of the baby either by inducing labor or scheduling a C-section. Prior to week 34 early delivery of the baby is generally not recommended unless the baby's health is at risk. When IUGR is diagnosed this early the appropriate response is to identify and treat the underlying cause of the IUGR (e.g., treating a maternal infection, improving maternal nutrition). Doctors will try to prolong the pregnancy to allow the baby to continue developing. Very close monitoring will usually be required with weekly or twice weekly appointments for the duration of the pregnancy. The standards of care for obstetricians requires the doctor to screen for IUGR. You do not need to present with risk factors. Every pregnant woman should be screened. This assessment can be based upon measurements made by looking at the mother's weight gain or lack thereof because IUGR diagnosis is predicated on the weights of the newborn and size of the placenta. Doctors also look at serial ultrasonic studies and fundal height measurements that may be inconsistent with normal fetal development. If there is a concern about IUGR based upon fetal weight or fetal measurements, the standard of care requires that the woman be placed at bed rest and additional testing be done to ascertain a maternal or fetal cause for the IUGR. The mother and child must be closely monitored. This puts the physician is in a position to determine the best time to induce labor or take the baby by Caesarian delivery. This monitoring requires serial non-stress testing, serial ultrasonic studies, BPP assessments and calculation of an accurate gestational age for the fetus. This allows the doctor to determine the various levels of maturity.